Icons are a vital part of the Orthodox Christian Faith. They are one of the ways that we Orthodox Christians involve all of our senses in the worship of God. Much like a photograph of a someone we love, Icons provide a visual connection to the beloved that we can use to bring them to mind and feel closer to them. It is often said that Icons were used for centuries to help often illiterate Christians, who were sometimes unable to read the Bible, to learn more about their faith. But, in talking to modern people, I find that just as Christians of centuries past could not read the written word, often modern people do not know the artistic language that Icons are written in, and so cannot learn from them the things that our ancestors could learn. When I first became acquainted with Orthodox Christianity, I was truly puzzled when people said that illiterate people could learn from Icons - they seemed to me just as inscrutable as Arabic or Mandarin. 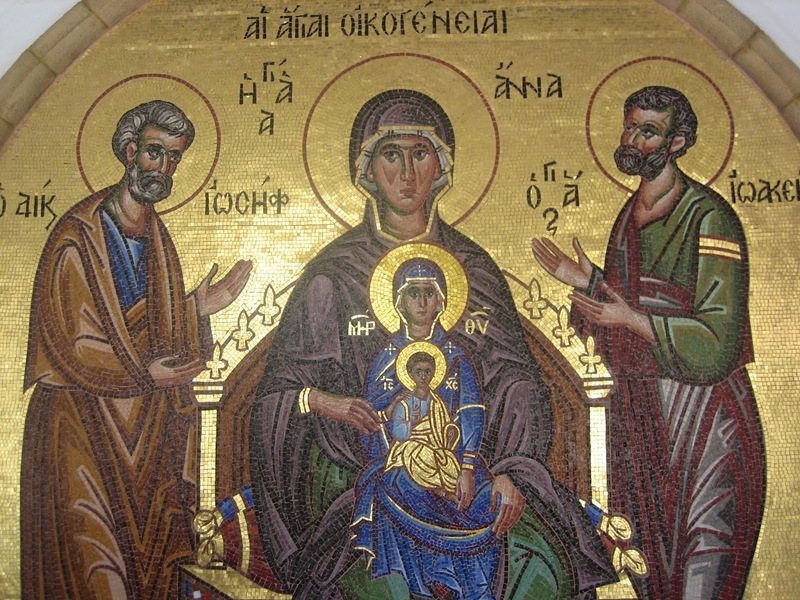 If a child, or a non-Orthodox adult looks at an Icon, they nearly always ask "What does this picture mean?" just as one might ask when browsing the family photograph album, "Who is this, Mom?" I'm writing this Icon Alphabet to provide a few beginner's pointers to the language of Icons, for adults and children alike. These are the things that I share with adult friends and with my young daughter to aid in understanding Icons - not a professional academic treatise. There are many very advanced & profound books on the language of Icons, but this is a beginner's Primer with a few basics - it is not perfect, and I'm sure it leaves out many important details. Remember that Icons have Tradition rather than laws that govern their creation, so you will always find exceptions to these "rules." I am Greek Orthodox, so a few of these pointers relate to the Greek language specifically. If the Icon you are looking at has Russian or English written words, things will be a little different. These pictures were taken in Cyprus at various Churches and monasteries; at Holy Trinity St Nicholas Greek Orthodox Church in Cincinnati Ohio; or at Three Hierarchs Greek Orthodox Church in Champaign, Illinois. A few are from private collections or books. A - Agios or Agia. B - Blue or Red. Blue is the color of Divinity or the Heavens in Icons. Red is the color of Humanity. You will often notice that Christ and the Virgin Mary wearing both colors. Partly this is because the colors are complementary and eye catching but it also tells us that Christ, being Divine, "put on Humanity" and the Virgin Mary, being human "Put on Christ." If you see someone holding small Cross in their hand, it indicates that they are a Martyr. A small, dark door or cave in an Icon often represents the darkness of this world. The writers of the Four Gospels, Matthew, Mark, Luke & John are called the "Four Evangelists." Each Evangelist has his own Symbol (from Ezekiel & Revelation). Matthew if often represented by an Man (or Angel), Mark by a Lion, Luke by an Ox and John by an Eagle. When you see these symbols in Icons, perhaps around a Pulpit or around the dome of a Church, they often refer to the Evangelists. Smiling for pictures is a new phenomenon. Often the faces in Icons look serious, peaceful, or even frowning, since their Subjects are dealing with serious matters. This is especially seen in Icons of Christ that depict His role as Judge. Small children might say "Why does he (or she) look angry?" But the Saints are not angry in their pictures, merely serious or peaceful. The background of Icons is often Golden - this shows the beauty of Eternity. H - Head, Hair & Halo. A Halo indicates Christ or a Saint - someone Holy. Holy people face the viewer so that we can look into their eyes- those who are not Saints are often shown in profile. Their hair is not realistic, but stylized - either to show a life of order & peace, or in the case of some ascetic Saints (like St. Mary of Egypt, John the Baptist, or St. Onouphrios) unkempt in an oddly geometric way to demonstrate their unpampered life of repentance. Indoor scenes are often depicted as in front of a disproportionately small building with surreal lines. Sometimes there are two small buildings with a cloth canopy draped between the buildings to indicate indoor space. This scene of the Mystical Supper, or the Last Supper, took place indoors. J - There is no letter J in Greek. We Orthodox Christians often kiss Icons to show our respect for the person in the Icon - much like we might kiss the photograph of a relative who had been called away to war. The lines on Icons are different from other pictures. Hair and clothing are geometrically arranged. M - Mouth & Nose. The mouth and nose of Saints are modestly proportioned (regardless of the actual physical features the Saint depicted may have had in life). This shows that they are not governed by their sense of taste or smell on this earth, but rather are focused on "the odor of sanctity" and upon heavenly things rather than on self-indulgent things. The name of the Icon is often written on it in Greek. If it is a single saint, "St. Basil" for instance, you will see the Saint's name in your upper right as you face the picture. If it is a scene (like Christmas or the Resurrection), it might have the name of the event written across the top of the Icon, "The Birth of Christ" for example. Keep in mind, that because of the shortage of writing space in ancient times, the Byzantines devised a lot of compact writing forms which are still with us today. This makes letters look like they are squeezed together - for instance the Greek Letters "NT" are nearly always written together rather than separately. And, some abbreviations are standard on Icons. O - Ο ΩΝ ( or Ο ων). P - Perspective & Profile. Surprisingly for the western viewer - the perspective in Icons is reversed - the viewer is "in the distance" not the background of the picture. This sometimes gives one the feeling of looking through the wrong end of a telescope. And, if you see someone portrayed in Profile, this sometimes indicates that they are not a Saint. For instance, if you see the Soldiers arresting Christ, they will usually be portrayed in profile. Notice in this Icon of the Mystical Supper, Judas is portrayed in Profile, without a Halo. Q - Queens, Kings, Emperors & Empresses wear Crowns. That includes "The King of this World" If you see someone wearing a crown, this indicates Royal status (many Saints were also Royal - King David for instance) but - be warned - "The King of this World" - is also depicted with a Crown. You can often recognize him from his lack of a Halo. St. Constantine, an Emperor, and his Mother, St. Helen are depicted with Crowns consistent with their royal status. R - Reality portrayed is Eternal, not Temporal. Faces are peaceful, golden backgrounds show eternity, physical features are refined and geometrical. Heads of the beheaded are restored (notably in the Icon of St. John the Baptist - in which he is shown whole, but also holding his severed head in a charger). All of this shows a reality greater than that of the present world. S - Suffering is rarely depicted on Icons. Often Saints are depicted with peaceful faces, even when undergoing great suffering. Most of the Icons of Christ Crucified depict Christ with a peaceful, not suffering face. Several events can be displayed on one Icon, even if they take place at different times. For the modern viewer, this is somewhat similar to a graphic novel (what we used to call "comic books" back in the day). Notably, in the Christmas Icon we see Joseph wrestling with his doubts, the newly born Jesus in his Manger, the newly born Jesus getting his first bath, the Magi journeying, and the Shepherds adoring - all in the same Icon. These events were not concurrent, but are all depicted together in one Icon. Unmercenaries were those with medical skills or healing gifts who used those skills and gifts without requiring pay. The Virgin Mary is usually depicted with three stars on her veil - one on her right shoulder, one on her left shoulder, and one on her brow. These stars indicate her Virginity before, during and after the Birth of Christ (often, you can only see two of the three stars, since the Baby Jesus is always in her arms, and therefore in front of one of her shoulders). Around her we see the letters ΜΡ θου - The abbreviation for "Mother of God" - indicating that Jesus was TRULY God in the flesh and that she was His Mother (not indicating, as some mistakenly think these words mean, that she preexisted and created God the Father). 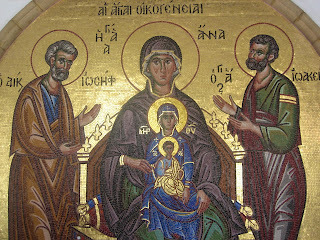 The Virgin Mary (often called the Theotokos or Panagia) is usually not depicted alone in Icons, but always with her Son. W - Window to Kingdom. We see Icons as a little window in which we can glimpse into the Kingdom of God. They're not an object of worship, but we do show them great respect, similar to what we show to our Bibles or to the Cross. St. Andrew's Cross is also X-shaped and is seen in his Icon. Children are depicted with small bodies, but with mature faces. Again, this shows the eternal reality depicted in Icons - we must become as little Children to enter the Kingdom of Heaven. Z - Zoo Animals & Props. Often an Icon will have an animal or another item depicted that will help you call to mind the story of the Saint if you are already familiar with it. For instance, St. Gerasimos is normally depicted with his Lion, and St. Catherine is sometimes depicted with the "wheel" upon which she was tortured, but miraculously saved from harm. Anna, this was quite an education for me. I never knew what these icons meant and I'm glad that you took the time to share them with pictures to help bring them to life. Thanks for sharing at Love to Learn! Pinned. This was really interesting! I appreciate how you've explained what icons mean to you with such humility. Thanks so much for sharing this at Booknificent Thursday on Mommynificent.com!